10 out of 19 people, who had orally told their story of involvement in community development/work, attended a workshop in October 2017 joined by two other interested people. What is happening with Community Development now and in the future? Have we made a difference? 5- In what form will our stories and this workshop be written up and for whom? 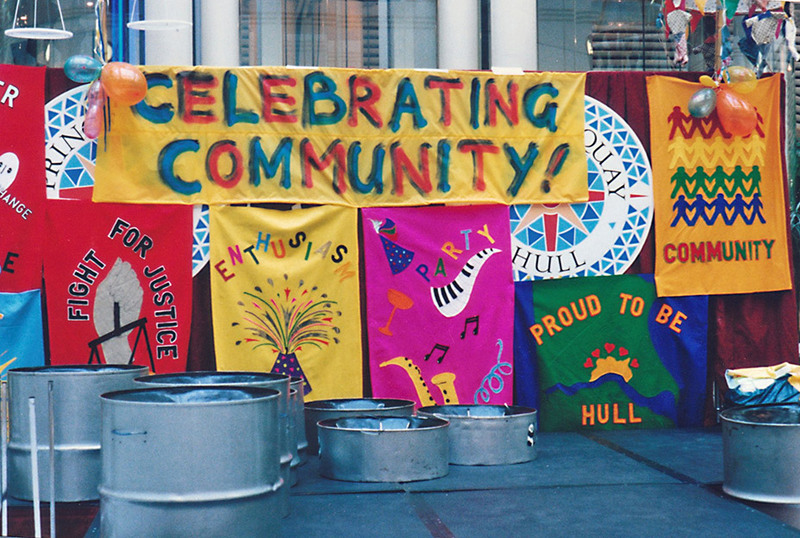 Roslyn Abbott was provided with some funding to do a small pilot to collect stories about community development in Hull from around 1985 to 2016, the time Roslyn spent working on community development in Hull before she retired. It was felt to important to have a record of these stories in the public domain as they were a part of Hull’s history. The workshop invited the other 18 people, who were telling their stories to Roslyn and others and concentrated on drawing out the stories’ emerging issues, looking at if and how a difference has been made in peoples’ lives, and whether things needed to change in the future. The stories were complete in themselves as an historic record of community development and the development of the community and voluntary sector in Hull. The write-up below includes some of the summary/analysis of the stories so far and the discussions held at the workshop. We ran out of time to complete some of the last, possibly crucial items on the two-hour agenda, including on how we had made a difference. There is room for the reader to add their thoughts and comments and scope for further evaluation/workshops. At the end of the workshop those taking part decided what they would like to see happening next and the form the stories should take and where to be placed. Please note- Initials of people against some of the notes below refer to community development storytellers’ comments, either in their stories, or in the workshop. 2.4 Policy – What policies and programmes influenced some of the work? 2.5 Community Development – What is it and what does it do? 2.6 Democracy and Power – How does it work? How do communities have a voice and influence decision making about their communities? How is this decided and by whom? Who decides on the interventions or actions needed to address community needs/promote community solutions and assets? Both used a lot in community development to make a difference? R Returned to Hull in 1985 after community development work UK wide. Obtained a job with the Hull Federation of Community Organisations, interviewed by the whole committee! Le Works for Bud Hull. From a family of community minded people. Lives in Hornsea now. Li Originally from Hull. Lived away for a while. Was an Army wife. Saw inequalities in that community which got her into community work. C Came to Hull 30 years ago as a student. Working for SEARCH for past five years. F Came to Hull in 1999. Worked for MIND, initially in Hull and Bridlington then as a Community Arts worker until going to Cambodia in 2009. Came back to Hull in 2016. S Done a lot in the Spring Bank area. Worked for Youth Action Hull then Hull Youth Service. Community activist rather than community worker. Liz Been in Hull since 1964. Has been a part of Hull Federation of Community Organisations, Community Matters, Lonsdale Community Centre and currently Carnegie Heritage Centre. A full-time volunteer who sometimes gets paid. Lu Been in Hull 40 years and is part of the Chinese community. Bi-lingual so met people involved in Community development at various meetings. Became active in establishing the Chinese Culture Centre. 13yrs ago she realised that Chinese elderly were a neglected group. Set up a group for the elderly which is very active. Da R Comes from Hull. 1990 community involvement in Gypsyville when training as a vicar. Became first a Trustee of CVS and then Chief Executive. 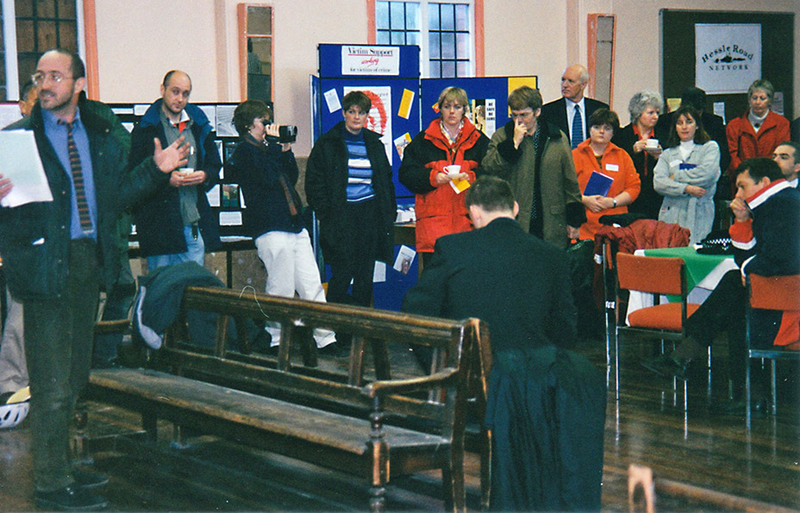 Helped set up Hull DOC (Developing our Communities) and SEARCH (Social and Economic Action Resource for Churches). Currently vicar overseeing Marfleet parish. A Have a job that enables me to do what is needed. ‘Stuckness’. The thing that got me into Community Development. Helping people see they can make a difference. Cor Coral Came into CW without intending to. Fell into it after various things eg: a degree. You go where the work is, where the people are, where the need is. Worked for Hull DOC for 5 yrs. And local authority in East Riding. Working with deprived communities. Went against what they wanted cos it wouldn’t work. Was listened to and was able to do things her way, in line with what works for communities. And it worked!! E.g: Street surgeries – police, fire service, NHS, church etc talking to local people. Got the Town Crier to announce it and people would come. Read about it the week before in the paper. Forgot. But came out when they heard the Town Crier. The Influences of other people, places, faith, values on some of the community work storytellers was evident. Some people ‘stumbled’ into community work, others, planned it. Others developed into it. Faith for some, and personal, societal values were important to all. In this kind of work, professional values were important too, because of the intervention in peoples’ lives. It was discovered that there were linkages between people, organisations and networks. E.g. Goodwin and Quality of Life- Linda, DOC (Developing Our Communities), Roslyn, Coral and Carol. Plus, people had often worked in similar organisations at different times! E.g. DOC, MIND, Community Focus, Hull CVS. It could be said that there is a ‘Family Tree’ of organisations and community workers in Hull. From peoples’ stories emerge: love (for Hull for its people and places), passion, politics, equalities, willingness to take risks, fighting for justice, working together and so on…..
A few people came into community work who are not from Hull. They came here wanting to make a difference. Why do people stay? There are lots of connections between people. It is said that people in Hull are stoic. But so are the community workers! Context is crucial, and meaning is important. It is interesting to have personal stories but what does it tell us about Community Development, from the workshop point of view in Hull (East Riding too?). What was the background, the circumstances leading to the growth of community development, community activism, and a growing community and voluntary sector between 1985-2016? How had austerity affected Hull and its communities? IT’S ALL ABOUT HULL! HULL IS UNIQUE! WE BELIEVE IN HULL! It really is all about Hull. It’s a hard place, people felt. It’s out on a limb or in The Middle of Everywhere! The title In the Middle of Everywhere, referred to a local film being made in City Culture of Year 2017 about immigration as people passed through Hull on the way to Liverpool and the USA from Europe. In 2017, Hull City of Culture; the world and Hull was beginning to ‘Believe in Hull’. Do Communities believe in themselves and their neighbourhoods? “Hull is a unique city, we can get ideas from other places, but we must be careful how we interpret this for use in this city. There is a stubbornness and hardiness here, but an openness too. People say it as it is” Quote from Anne D.
In years gone by, people in Hull had a’ bad deal’; such as the heavy bombings in World War II, Fishing Industry demise and so on. People needed to be gritty to survive, so, the City of Culture may have been perceived as being too ‘airy fairy’ by some geographical communities. In the 1980s/1990s Hull had a paternalistic Council, it was felt. It was a “cowed” place, with low, unenergized people, accepting their low position”, said one storyteller. Hull had, according to statistics and personal experiences, deep seated problems at an individual and community level. The City, it was felt by some of the participants had been affected by political patriarchy and control. There are, apparently, currently (2017), a high number of fatherless families in some areas of the city, such as Preston Road area. (2017). Alcoholism, drug abuse is perceived as being high in Hull. These issues can be backed up by facts/figures, reported the participants. Austerity had led to fewer resources for communities and an increase in poverty in Hull. Note the rise in Foodbanks, debt managing services. People in Hull were not used to organising themselves? Some were...! David B reported in his story, that there was an historical lack of Trade Unionism in Hull. Fishing and Dockers were casual labour. People were not used to organising themselves and fighting for their rights or forming Trade Unions. Roslyn A from her experience in Scotland, recounted how extensive and active Trade Union involvement in Glasgow meant that many community leaders and groups were more organised than those in Hull. Not always the case, it was argued. People like Lil Bilocca from Hessle Road, Hull fought for the rights of fishermen’s safety. Hull Dock Workers/Unionists were more likely to complain and campaign when things were not right. E.g. Ros A remembered the HFCO (Hull Federation of Community Organisations) early committee years when some of the East Hull community centre members, who were Dockers, were quite vociferous and challenging over certain decisions. Their Union involvement had taught them basic human rights to fight for and campaigning methods. A couple of interviewees gave good examples of Hull community leaders such as Gina Holdsworth (originally from East End of London) plus Lil Bilocca, Liz Shepherd, Luana Smith. The latter two have stories on this web page. People in the workshop/seminar had done their fair bit of fighting to improve life for their communities! Hull had traditional communities around fishing on Hessle Road and port activities at the Docks. Hessle Road communities, because of poor housing, were badly, and quickly dispersed, decimated in the 60s with a negative effect on community and family ties. People in Hull need to be believed in and respected. Not just Believe in Hull, but in people and communities. How do we help people believe in themselves, value each other? ‘With Love’ said some of the community workers in their stories. Is paternalism and control diminishing in Hull? Despite the past difficulties of Hull, are things improving? E.g. City of Culture, increased partnership ventures between organisations, business and local authority? Many of the stories of 80s and 90s demonstrated a threatened local authority, one wary of the Voluntary and Community Sector (VCS), of being challenged by them. e.g. giving grants to some who then campaigned against the Council e.g. HIHAC (Hull Independent Housing Aid Centre). The CALC (Community Associations Liaison Committee) in the 1980s was an example of community associations through the HFCO working together with the City Council around community centre development and strategy. Hull has a legacy of being done to and being controlled and communities being quickly broken up e.g. Hessle Road in the 60s. Yet some appear to stand well. E.g. Greatfield , and new communities are developing. How are we integrating, helping each other with people of differing backgrounds and abilities such as: refugees, East Europeans, marginalised people in neighbourhoods, poverty-stricken residents, people with disabilities, addicts, the homeless, LGBTQ etc? According to HANA (Humber All Nations Alliance), Hull’s ethnic population has gone from 1-2% in 1985 to 12% in 2017. The % may not be as high as this but the diversity of many of Hull’s communities has increased since 1985, offering Hull a colourful, multi-cultural dimension. Does Hull and its communities have identity? There is a grittiness of Hull people e.g. Greatfield compared with the ‘airiness’ of City of Culture! Community Workers were highly committed people, many doing things without money. Some people worked and lived in the area, especially Christian groups such as Hull Youth for Christ in the Boulevard, Spring Bank Community Action Group in 60s/70s/80s. 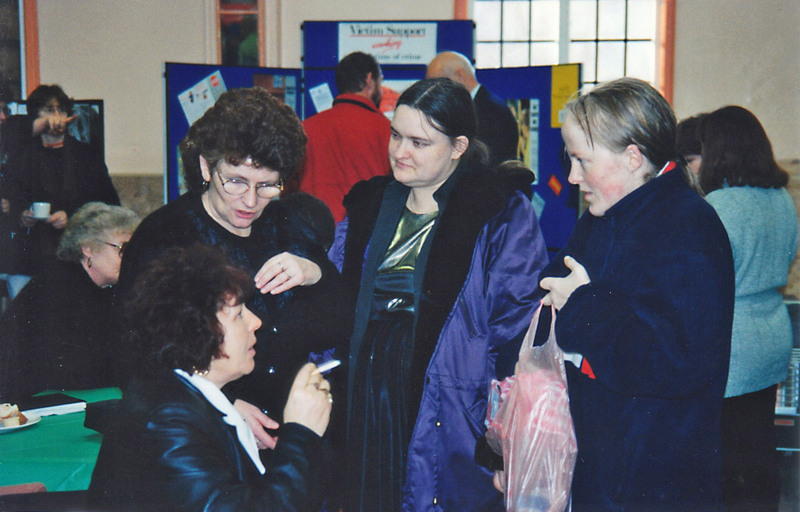 Hull Youth for Christ had been established in the Boulevard for over 20 years building up relationships and activities with young people and their families. More churches are doing social action now than they were say in the 70s and 80s. Andy Dorton initiated some of this in his role as Church of England Social Responsibility Officer. According to David B, Hull was the last place/city to set up a CVS (Council for Voluntary Service in 1982). Where did the Sponsors of Community Development come from? Under whose auspices have we been doing these things? Who pays? Some of the funding came with Government programmes. See the Timeline page for more information. Some people do community work with little or no money e.g. Sue, Luana and Sam. Others volunteer. Austerity and funding cuts have negatively affected resources for communities in recent years. Short termism has been at play with people, organisations and Governments not realising that Community Development takes a long time to change things. Many of the funding regimes were demanding quick results. Are we over the Thatcher era yet? We pondered in our stories and workshop discussions - Are we over the Thatcher era yet? No society, but individuals seeking capital for their own gain. Has the concept of community-working and sharing together disappeared? Did the government understand Community Development- or want to control it? Going from grant giving to contracting out/bidding for funds was not good for smaller groups. Community Development at times has been forced to respond to major policy changes. David Burnby – See Dave’s story on the web page. Personal and professional values were needed to justify the right to intervene in peoples’ lives. If workers had faith values, these were often shared with other community workers e.g. Christian community workers group. Important for workers to understand power, and who makes decisions and where. Hull Community Network’s (HCN) ‘How your City Works Course’ was effective in enabling people (workers and residents) to understand power, where decisions were made and how they could have a voice and influence. e.g. personally, and organisationally such as Sam’s story (on this web page) linking a refugee with Ground. How Roslyn linked organisations/Churches on Thornton estate and elsewhere so they could develop positive work and relationships with Prostitutes in the area. Some people lived and worked in an area e.g. Andy D, Sam., Cathy (All Christians). They feel that that is the way to develop relationships, to do Community Development. Compare with Short Term Interventionism because of a Programme, funding, where professionals emerge in an area or carry out a community development programme across for a limited time with built-in targets to meet and then leave. Does Hull have the capacity to run and develop its own community organisations and buildings? A Community and Voluntary Infrastructure was now needed. Does Hull have good networks and partnerships? Communities, community and voluntary organisations have suffered from the demise, not only of VCS infrastructure organisations, but also community groups. ‘Once people get status they don’t kick off anymore’. (Sue A) e.g. people involved in CVS, HFCO. Differing ways of doing community development? Traditional community development work is developing with other concepts, processes and methods e.g Empowering, Transforming, Transcending or doing Direct Action? Transcend through the arts? (Andy D). Bringing out inner creativity of people helps build confidence. Is this community development? Community Development has shifted from one sponsor to another. Helps explain why Community Development takes on different directions at different times. Like the LARGS (Local Area Reference Groups that DOC used to hold in areas). These were beneficial for communities of interest and place. Bringing people together. Communities can be helped to look first at their assets and not their problems and was a positive way of empowering communities. There is/was planned AND organic community development. Sometimes this had been missing. It was partly needed to address, in the past a hostile, initially political atmosphere, but partly to ensure good quality community development and support to the workers. How do we integrate people if they are stateless, or on the margins? This is about how people engage in local networks and with voting, liaising with people/organisations outside their area. It was felt that Hull was strong, internally in neighbourhoods, possibly. It was not good on civic or external engagement. People are wary of authority and agencies. Some people have a strong identity of Place e.g. Greatfield. Others less so e.g. Rosmead Street. There had been racism towards ethnic communities, for example around community centre development and provision. Are we addressing poverty, marginalisation, debt appropriately in and for the City? Are Foodbanks helpful and needed? What is society/Hull doing to help people be included? Full citizens? Questions that were asked in discussion and in the stories. Is the community development work carried out in the city giving people the voice, the confidence, the work, the power to address personal and community needs? How Hull helps the marginalised and the stateless e.g. homeless, asylum seekers, people in neighbourhoods with no money/difficulties or debt, addiction issues etc. How can the silent voice be heard and take part? HANA (Humber All Nations Alliance) currently does things through activities such as football, festivals. They apparently did acclaimed Mental Health work for several years with black and ethnic groups and individuals, but the current contract went to North Bank Forum as they managed greater amounts of money which was one of the criteria for the latest funding. Contracting out doesn’t work for smaller, more grassroots organisations. It was felt that community development benefits from taking an assets-based approach, as well as or instead of, needs based. e.g. Asset Based Community Development – ABCD builds on the assets that are already found in the community and mobilises individuals, associations, and institutions to come together to build on their assets-- not concentrate on their needs. Not to be confused with another ABCD approach which is Achieving Better Community Development – Achieving Better Community Development (ABCD): A framework for understanding, planning and evaluating community development. It was devised by the Scottish Community Development Centre on behalf of the DHSS in Northern Ireland and subsequently rolled out into the UK. There are, of course many theories, tools and processes for development based on community development values, commitments and profession. Values, Commitments Social Justice enabling people to claim their human rights, meet their needs and have greater control over the decision-making processes that affect their lives. Participation – facilitating democratic involvement by people in the issues that affect their lives based on full citizenship, autonomy, and shared power, skills, knowledge and experience. Equality – challenging the attitudes of individuals, and the practices of institutions and society, which discriminate against and marginalise people. Learning – recognising the skills, knowledge and expertise that people contribute and develop by taking action to tackle social, economic, political and environmental problems. Co-operation – working together to identify and implement action, based mutual respect of diverse cultures and contributions. Challenging discrimination and oppressive practices within organisations, institutions and communities. Developing practice and policy that protects the environment. Encouraging networking and connections between communities and organisations. Ensuring access and choice for all groups and individuals within society. Influencing policy and programmes from the perspective of communities. Promoting social change that is long-term and sustainable. Reversing inequality and the imbalance of power relationships in society. Supporting community led collective action. DEMOCRATIC THEORY – Representative and participative and Who holds the power? In the past, Hull City Council hasn’t liked participative democracy from the Voluntary and Community Sector (VCS). However, community reps were elected to the Community Associations Liaison Committee with Councillors in the 1980s/90s. Basic partnerships were developed around community centres. Community and Voluntary sector representatives were elected to ONEHULL the Local Strategic Partnership in the 2000s. Hull, it appears, for many years wasn’t ready for participative democracy. Yet it is a basic human right to be able to have a right to live, work have an opinion, be respected etc. Dave B said in his story: “The Council had issues with the VCS (Voluntary and Community Secto)r and struggled with the concept of the Council funding organisations to fight the Council (“biting the hand that feeds it”), particularly when criticising its role as the primary social housing provider and in some cases, leading court action against it. e.g. HiHac (Hull Independent Housing Aid Centre) and the Law Centre).” This was around 1970s/80s/90s. Roslyn A remembers how hard it was to work in Hull in the late 80s/90sbecause of the antagonism of councillors to what they saw as unrepresentative community groups. They didn’t like being challenged. There seemed to be a belief that as Councillors were elected by the people (despite low voting turnout), then they spoke for their communities. In the future, after City of Culture, it was felt, by the workshop, that more work was needed in local communities and communities of interest on community development, people believing in themselves, love, developing relationships/networks, having a voice and so on. All types of community development and at differing levels as described by the storytellers and workshop participants was needed: from: one to ones with people; living and working as community workers and residents in some areas and neighbourhoods; working with groups; developing history/heritage with buildings; creating spaces; promoting art/enterprise with people and doing it for ourselves (with others) and local and national politicians. ‘We need to build Social capital’, workshop attendees said. Goodwin Development Trust say that they “operate in the spaces that Government has left” (Gill H). It’s being risky, working outside of the box, but often necessary. Community Engagement/Involvement- ladders of Participation or multi-faceted engagement? A pause in the workshop for a bit of theory and reflection from the workshop! It was felt important to know and understand about power, who held it and where and how decisions affecting communities could be influenced and changed. ... in the 1990s that there were five elements of a community involvement strategy if we are to change things. (Ref: Labyrinth Training and Consultancy – Five Elements of a Community Involvement Strategy). Grass roots community work support. If a community group spends time and energy for example, developing a campaign or a facility, but doesn’t have the support of its community, organisations, local government, then often change doesn’t happen. All the above needs to be in place to ensure support and influence for communities. “Hull has never had all those levels working together”, is a general opinion. ONE HULL, Hull’s Local Strategic Partnership did try to address this in early 2000s. This sometimes comes about through the influence and contact with other people at home and away from Hull. Some of the community workers in Hull may have had an impact/influence on those around them, because of how they live e.g. Biblical, ethical, caring, loving, challenging etc e.g. Dortons in Bransholme, Hemburys in the Boulevard and Hull Youth for Christ (Emma, Cathy, Sam mentioned them). See the Community development stories to see how community workers and communities worked creatively within and without the system to achieve wider community benefits and quality of life. This sometimes came about through other people, a need expressed by a commuity or was part of a funding programme or policy. Some community workers may be influenced or impacted by other people with their ideology and working practices e.g. how people live their lives, where they live and perhaps doing so in a Biblical or ethical, caring, loving, challenging way. 3 – What is happening with community development now and in the future? Gill Hughes from the Hull University Youth Work and Community Development degree course has explained that community development is alive an dwell.. – She asks the question – How can we reconfigure the common good? – Develop mutual aid in the city and amongst neighbourhoods? See Gill’s story on the website. She believes that there is a lot of ‘good stuff’ happening in Hull now in terms of community development. The Community development and youth work degree has been approved and the course has students. Gill Hughes – University of Hull – See Gill’s story on this web page. Andy Dorton who has a story on this web page, has also attended events around What a Society can look like (in Hull) based on this work. Community development is looking at Transformative Change. Margaret Ledwith and Jane Springett in their book Participatory Practice – Community based action for transformative change (See Bibliography at the end) – writes on developing practice around Paulo Freire’s work (Pedagogy of the Oppressed), plus use of stories, dialogue, community arts, environment , learning to reflect and challenge etc in order to work with people to bring about transformative change. -The authors talk about critical reflection, sustainability, dialogue, storytelling,‘and a ‘redefinition of Social democracy’ to widen democracy (p 47). There is a third way of politics: globalisation, transformation in personal life and our relationship to nature. This transformative practice- also includes changing ourselves (p201). Theory in action. Other tools: Story dialogue (p143), Open Space Technology (p145), Appreciative Inquiry p 145, The use of story p 118 and 103.Integrative Practice (p 78); Practitioners using critical reflection; practising Mutual Aid, working for the common good. Is this kind of practice the way ahead for community development? Community development , community groups and their support and infrastructure had declined over the years . Austerity has taken root. Hull needs more money for community development now and appropriate infrastructure to support it. Larger groups do not appear to be community focused. Orchard Park and Greatfield received some lottery money. (£1M?) . People need spaces to develop, be creative, gain confidence, skills etc. Some people felt it was living dark moments again, talking about past and present community development as they felt there was very little happening now, compared with the past. Community centres hire centres out for training etc rather than open up to community groups. There is a lot of addiction in Hull and associated problems. People appear not to be aspiring to things beyond them and are staying stuck in addictive behaviour, allegedly. There are less community activities going on, so communities stick to their own, it appears e.g. Polish, Muslims, English. Need more events/activities to bring people together. There is a need to be aware of other cultures, how they function, what their needs are. Greatfield (Big Local), where Lottery money allocation for the area is decided by residents. See David Burnby’s story. “ It’s worthy of examination. It’s a good community development model” Dave B talking about Big Local Programme. -Resident led. Big Lottery funded. Goodwin Development Trust – Thornton Estate – See case study in Gill Hughes’s story. SEARCH – provides Infrastructure support and help for Community work/ community action, anti-poverty work, etc in Churches, Christian organisations their workers/volunteers and their communities. Partnership work and networking is encouraged with other organisations. The reader of this may know of other community development work! Add your story to this website! Contact details on the Introduction page. What does Hull need now and in the future, to support community development? A VCS (Voluntary and Community Sector) support infrastructure developed and there being space to allow risks and mistakes. Learning and better outcomes can come from this if well monitored. Also needed are some financial and other resources; an overview with communities and voluntary/ statutory organisations being on board, including the local authority. 4 Have we made a difference? Sue – Kids on Mayfield St were originally part of a play scheme are now doing youth work and taking a lead in their communities. Ros – We all know individuals whose lives have improved. But what about communities? Liz – How your City Works course. Lots of people who went on that went on to greater things. Ros – Community Learning. Has helped a lot for those who missed out at school. Luana – East Riding classes. Computers etc People (Chinese) would never have tried to learn if it weren’t for them. Linda – A lot has been achieved but we’ve let it go cos it takes a lot of energy to keep it going. Sometimes we run out of energy. eg: Community Network. Then it gets destroyed bit by bit. Sue – Not always good at handing things on. Letting others get on with it. Andy – Outer estates aren’t really communities cos they’ve not been around long enough. 50 years is nothing compared to how long Cottingham’s been around. How do you measure communities? What does it mean? Micro-communities perhaps eg: half of Coltman Street, Ella Street. Sue – Most people get involved cos they find themselves getting involved. Are invited along to things. The trouble with community people is that they’re just good at getting on with it. So wouldn’t necessarily stop to reflect if they’ve made a difference. It could become a discussion for academic dialogue. Ros – What if we had kicked against the establishment more? Which would have taken more energy. Linda – Frustrated about hearing people talking about things we were doing in 2000. And not getting it right! Taking bits of things and not really understanding what it’s really about. Ros – Bastardisation. Community Development has been whitewashed by the authorities. Dave R – The government understood it quite well. As soon as you start challenging people’s power base, they shut it down. Community Development is a threat to the authorities. Ros – It comes back to power. Who has it. Not letting local people have a say. Liz – Community Liaison Committee – the local leader being belittled in public meetings. Sue – You get some really significant people in at the wrong time. And it all goes pear shaped. Ros – Do national authorities really want local communities to have a voice and more power? No! Luana – We started from scratch. After a while at a community centre and then eventually we had our own centre. Then we could get on and do stuff. Sue – Community centres are a neutral space. Less now so people look to hire churches for community spaces. Not always good for groups of different faiths. Linda – Lack of resources. People are frustrated with crime levels etc so people are starting up neighbourhood groups. Coming out of frustration though, so how long can they keep going? Sue – Alan Raw. Never getting involved in youth and community work. Someone invited him to an event, now doing all kinds of things. What is community? Is it inter-generational? Is it shared interests (eg: Ground). What about the impact of social media? Community is different to younger people these days. There were many physical, economic, influencing, personal benefits and outcomes from the community development experienced by residents, organisations and communities, plus physical buildings. See the stories on the web page. Various forms of evaluation and outcome monitoring have been used according to funders/community requirements. Time ran out… The workshop believed that the authorities find community development threatening. The stories provide examples of how community development makes a difference! Fiona – Take time to step back and see what you’ve done. This whole process is a healing thing. Might not be perfect. CD will always be messy. There’s always stuff to do. But look at what you have done. Take time to celebrate what has happened. Coral – Used to celebrate more. Hull DOC used to be v good at it. Sue – People don’t appreciate the thought and planning that goes into creative and seemingly spontaneous events. Be good for the nuts and bolts of planning to be seen. 5-In what form will our stories and this workshop be written up and for whom? What does Ros do next? Documenting people’s stories from the 70s onwards. To go to the library and a web page of Carnegie Heritage Centre, so that the public can read them and add to them if necessary.? Throw perfection out the window! We will have a record of Community Work in Hull from our points of view. Write up what’s there so far. Have it as an e-doc. People who don’t have time might be drawn in that way and add their story to the mix. Chambers. R (2002) Participatory workshops. A source book of 21 sets of ideas and activities: Earthscan, London. Chambers. R (1997) Whose Reality Counts? Putting the first last: ITD6 Publishing London. Freire, Paulo. (1970) Pedagogy of the Oppressed. London. Penguin Books. 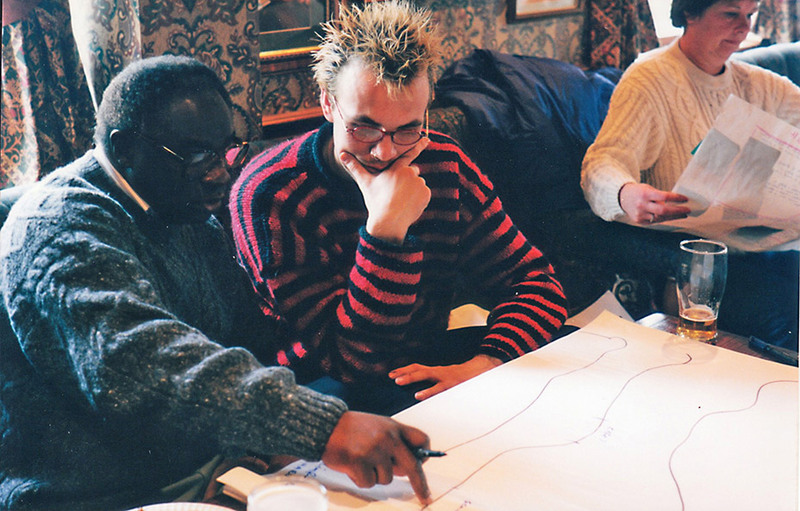 Labyrinth Training and Consultancy (1996)- Five Elements of a Community Involvement Strategy). Ledwith, M. (2016). Community Development in Action: Putting Freire into practice, Bristol: Policy Press. See also the individual stories.